This was Challenge #61: And here’s the answer: Copyright Â© 2008 Barrie Brewer, Nikon D300, 18-200VR, 1/250s shutter, f8 You guys are good! This was a hard one. This postal box is in the United Kingdom, in Epcot’s World Showcase. 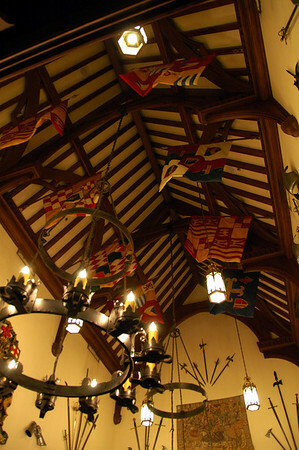 I’ll go easier on you this week” Anne Hainsworth was the first to send in … Continue reading "Where in the World #62"
The Crown and Crest store in Epcot’s United Kingdom pavilion. Â© Scott Thomas Photography 2007Nikon D70/18-200VR, 1/15s, f/3.5, 450 ISO, +1 EV, 18mm Focal Length While “researching” family crests and name histories in the United Kingdom’s Crown and Crest store in Epcot, I suddenly remembered the old Walt Disney themepark fan’s adage, “Look Up!”. I … Continue reading "Photographic Innoventions: Look Up!"